Aunt Dimity: Vampire Hunter is the thirteenth book in Nancy Atherton's "Aunt Dimity" cozy mystery series. For those of you not entirely familiar with the series, Aunt Dimity is a ghost whose spirit is attached to a blank journal, which Lori - the heroine of the series - refers to when she needs advice and guidance with solving mysteries. In Aunt Dimity: Vampire Hunter, Lori investigates whether vampirism exists in the Cotswolds after her twin sons claim they've seen a vampire during a horseback-riding expedition in the nearby woods. Although she's in disbelief, Lori isn't so quick to write off her sons' story, given how honest (and supposedly angelic) the twins usually are. She then sets out to discover and learn everything she possibly can about the people who live near the woods with hopes of exposing the "vampire." This novel started out as very irritating - mainly because I found it hard to believe that Lori genuinely lacked knowledge in vampire lore and vampirism in general. Whether a person is interested in vampires or not, they're bound to know the basics of vampire lore, such as vampires needing to stay out of the sun, the rules associated with exposing them to garlic and crosses, etc. Lori's lack of vampire knowledge as a character results in Atherton going into very detailed explanations about the basics of vampire lore, which I found to be redundant and silly. The majority of readers will already know about vampire lore, especially given how large a role it plays in media and in the entertainment industry these days. The novel would have been more bearable had Atherton dropped a few references and reminders about vampire lore here and there instead of regaling us with a full-blown vampire history lesson. The plus side to Aunt Dimity: Vampire Hunter is that we discover and learn new things about Kit, which ends up being more intriguing than the core mystery that surrounds the vampire hunting plot. Kit is such a mysterious character at this point in the series, but readers and fans will get to learn more about him than ever before, which really makes this novel fully worthwhile. The novels that follow Aunt Dimity: Vampire Hunter in this series are Aunt Dimity Slays the Dragon, Aunt Dimity Down Under, Aunt Dimity and the Family Tree, and Aunt Dimity and the Village Witch. 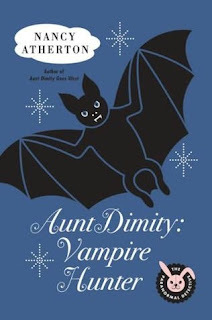 What did you think about Aunt Dimity: Vampire Hunter? What are your favorite cozy mystery series? Share your thoughts with us in the comments section below this review!